We have artists. We have artists who win awards. 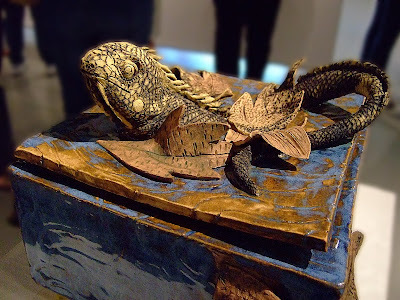 We have Elizabeth Newcomb's Iguana (box #3), that won the the Three Dimensional Art Best of Category award. I found it was hard for me to sit through this documentary "Beautiful Losers." I read about the story and watched the trailer, so the movie didn't surprise me and then it became boring. But it indeed made me want to go home and make art. I think he trailer is much better than the film itself.